Hello! Here's the first of only 2 cards from me this week (afraid this 'more work' malarky has no consideration for crafting & blogging - sorry!). 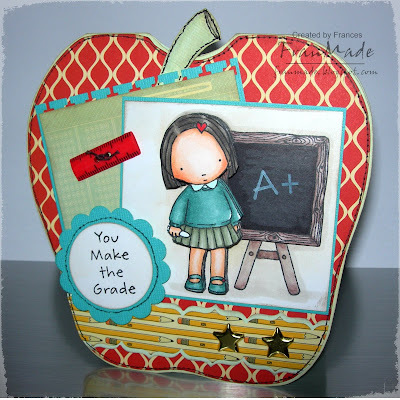 After making this apple card it got me wanting to try more shaped cards so had some fun trying to come up with a mailbox shape (US style) to go with this cute PI girlie (available to pre-order here if you're quick). 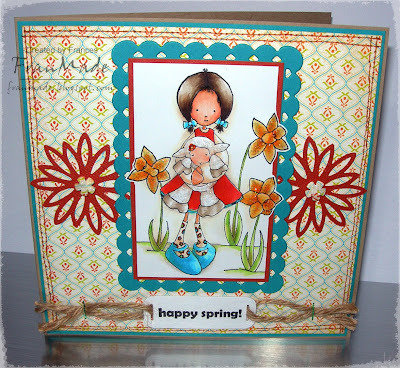 Ooooo and I was well chuffed when I found out the apple card I mentioned was picked for the MFT blog's 'favourite finds' today :D Something to brighten this dark wet day - what happened to the spring weather?! That's all for now, see you Thursday for my CCT card. Thanks for visiting & any comments you may leave - always love & appreciate them. 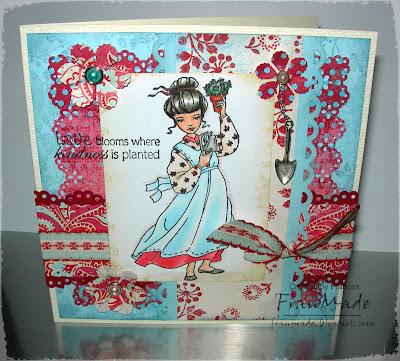 Hiya, here's the other card I made, just for fun (well, it was supposed to be for the WoJ challenge when it was 'Easel cards' but I'm way too late for that one!). The image is called 'in search of spring' which is very apt for the weather around here, hope it stops raining soon! Wanted to try using different shaped base for an easel card and ended up with this dinky thing (used the largest die in the scallop oval nesties). 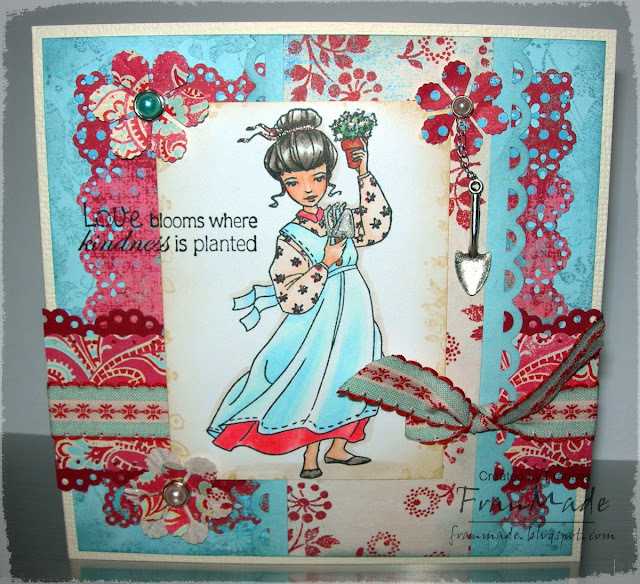 Not much else to say about this one really, just added some flowers and sentiment and job done. Well, I've exhausted all my cards for now so I'll see you all next week sometime. Hello, hope you're all having a good week so far. It's CCT time again and this week we want to see 'dimensions' so I've gone with good old decoupage which looks great in the flesh but not very obvious in photos. 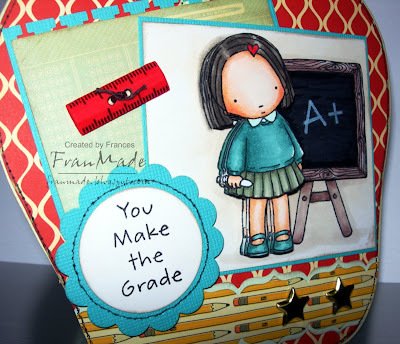 I've used another cute PI stamp (available here and I know there will be more new ones in stock soon - can't wait!) She's been stamped out 4 times and then cut out various bits before layering her up with foam pads. (see photos below for better view of the layering & depth). The apple shaped cardbase was just hand drawn by me and cut out by hand, then covered in DP and added a little green stalk on top (it should really be higher but it needs to be at that level so that it'll fit in a 6x6 envelope!) It opens up so it's hinged at the top, either side of the stalk. Here are some shots from the side to show you the layers. Don't you love that ruler button?! I knew they'd come in handy some day. That and couple of gold star brads was all the embellishments I thought it needed. 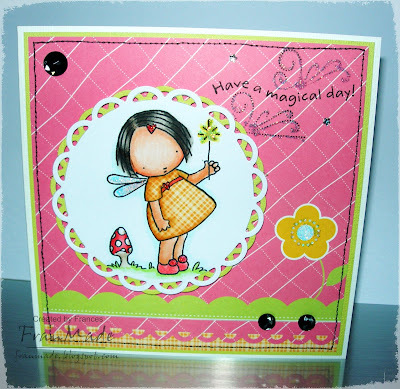 I've got 1 more card to show you but will leave that for later tonight or tomorrow after I've taken photos etc. Thanks for visiting. Didn't want this too girly so kept the flowers off and just added a few pearl and gem accents. Tried to take couple of shots to show you how it looks from side and also when it is folded flat (click for larger view). Well, hope you're all having a good start to the week. The sun's come back out and it's staying lighter for longer which is a good sign. I'm actually working tonight and I'm going to be needed more at work from now on, so my craftiness will be hampered and my blogging will get less frequent. 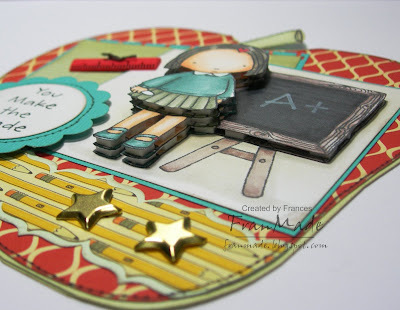 However I will try to post at least once (my Thurs CCT card) or twice a week. Will see how it goes, so don't desert me o.k?! Oh, look, it's another PI girlie, what a surprise! but at least I've coloured her ALL in, and not done any paper piercing this time ;) I promise my next card will be non PI! 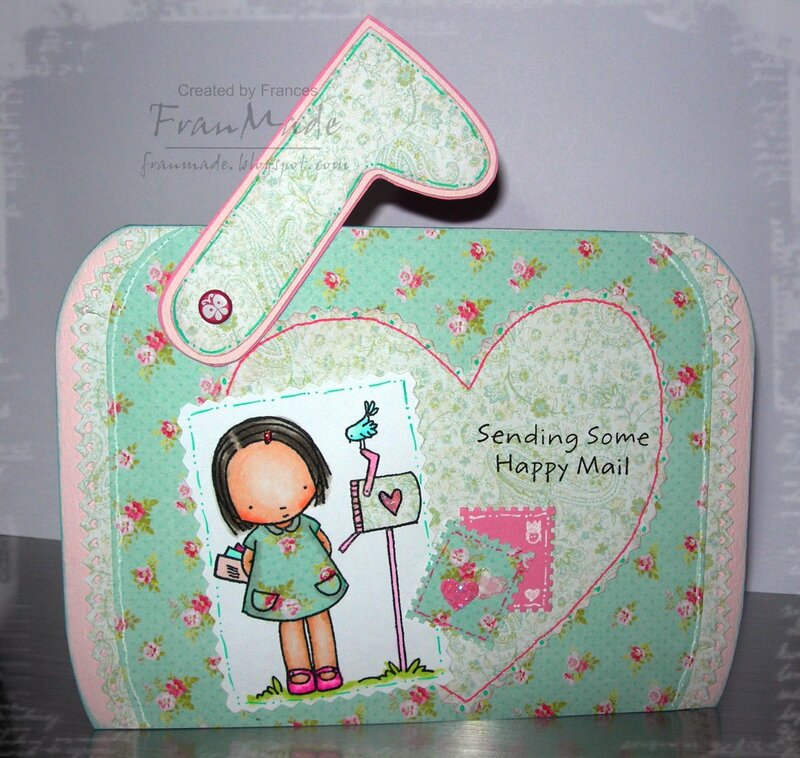 Tools: MS around the page border set for the pink mat, Doily deep border punch for the white strip, Nellies Multiframe rectangle, scallop circle punches for sentiment. Working tonight so probably no more creations to share until next week. So have a super duper weekend and I'll see you all sometime then. Here's another adorable Pure Innocence stamp. 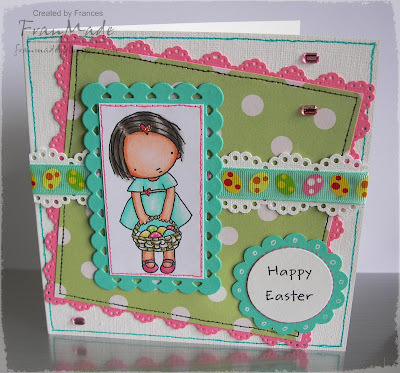 I am loving make quick simple but sweet cards with these. So simple that I think it's all pretty self explanatory :) and yes, I've paperpierced her dress again - can't seem to stop doing that with them! Only thing you can't see from the photo is the cicular image has been raised on foampads so more depth to it in the flesh. 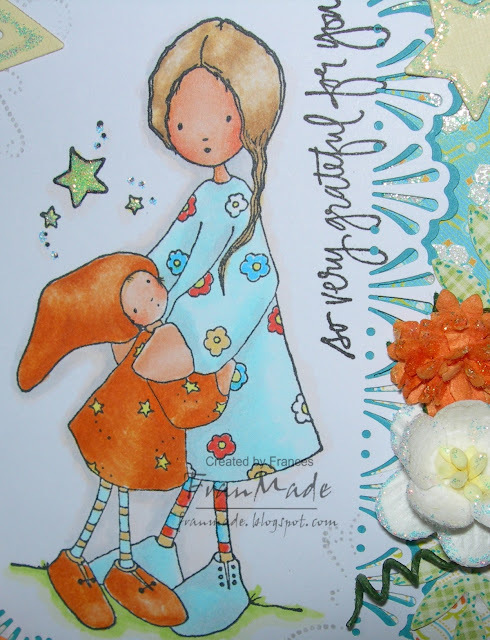 I've used another of the sweet images from WoJ's latest release as I thought they were perfect for ananniversary card (seems Katharina had the same idea too ;) ). Gave my Copics a rest and watercoloured them with a mixture of distress inks (my yummy new colours finally arrived) and twinkling H2Os. 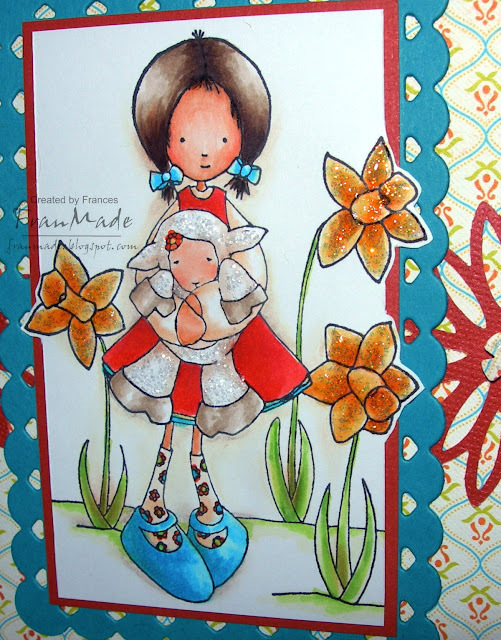 Also used the fab sketch over on Friday Sketchers. I made the mistake of colouring in my image and then cutting it out with a nestie shape which I then didn't like at all but didn't want to recolour another one. 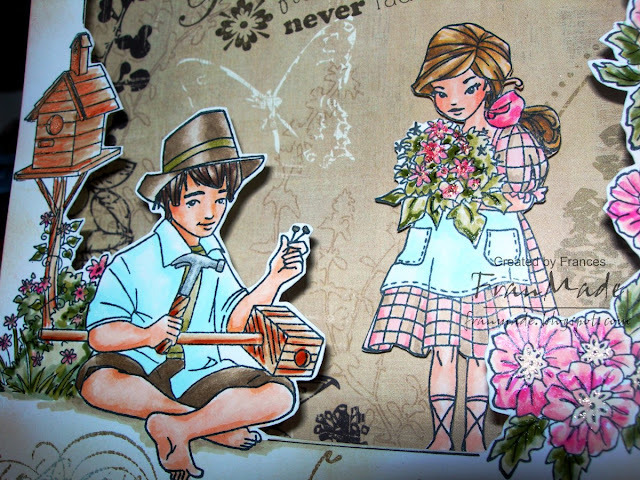 So I salvaged it by cutting out the cute couple and making them 3D on another one I stamped out. The background is mixture of spritzing on glimmer mists and randomly swishing some distress colours - I loved how it turned out (and as with all my experiments, doubt I can repeat!) Here's a close up to show how lovely it shimmers when the light catches it all. That's all from me for now, so have a lovely Thursday. 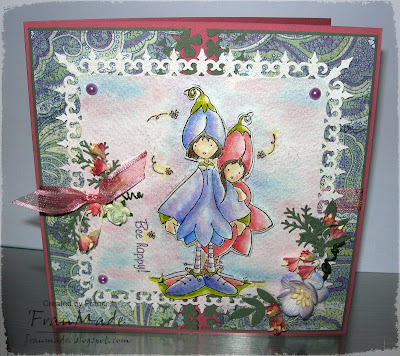 I'm umming & ahhing whether to get the Magnolia spring kit (think last chance today) or the fab new CC Swiss pixie kit. I'm leaning towards the pixies but then what if the Magnolias a good one?! Nightmare for someone as indecisive as me (I really shouldn't get either but can't see that happening - it's a miracle I'm not getting both LOL) . . hmmm. . .
MFT Pure Innocence ~ ". . .Whee!" Oooooo look what Silly Monkey have in stock now, yup the ultra cute Pure Innocence stamp range by MFT (My Favourite Things). I just fell in love with this cutie pie when I first came across her a few weeks ago on some of the US blogs but Bryony has them in stock in the UK now, so you don't have to wait for them to cross the pond like I did! (I know how impatient we can get whilst waiting for our goodies heehee). I also know these have been flying off the shelf in the states, so you'd best be quick. 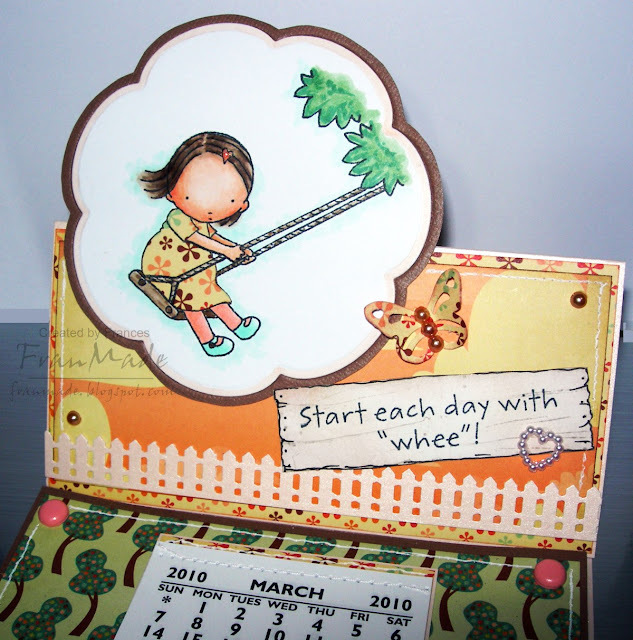 I love all the sentiments that comes with each set and in particular this one- "start the day with 'whee!'" 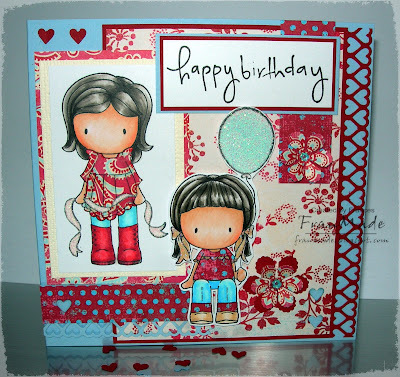 just puts a smile on my face just saying it :) so had to use her straight away & make an Easel calender card for myself. I just forgot how difficult it is to try and get a decent photo of it all! The peachy paper behind her actually has cloud pattern on it which I thought was perfect for this but I've pretty much covered it all by the time I'd finished it all, D'oh! I paper pierced her little dress (I think this range is fabulous for paper piercing - another reason why I prefer ink & stamps over printed digis. I know you could print onto DP too but would be too much phaffing for my liking) I just doodled a wooden board around the sentiment and sponged it to look a bit weathered and then stamped out the tree bit again and cut out to use as tufts of grass either side of the calender but not sure if I've managed to include that in the photo. Think you can just about see the one on the right! 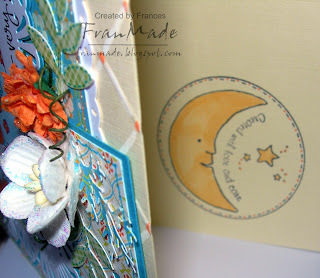 Anyway, shall leave you with a couple more shots of my card. You'll be seeing a few more of this girlie on this blog that's for sure. Thanks for dropping by. Hope to see you Thursday for my CCT card. 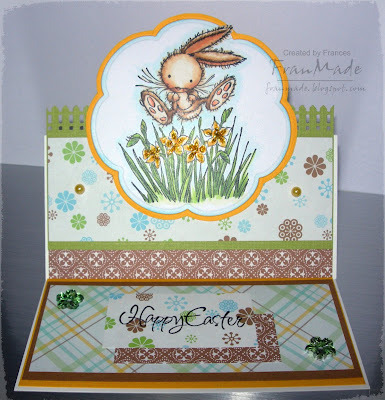 I've embossed the yellow cardbase with my Scor-pal to give it a quilted look and then just doodled over the lines with a white & orange pens. 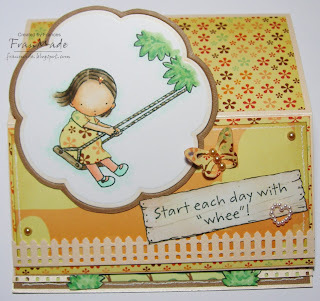 Papers are from DCWV 'citrus stack' again (notice how I seem to make couple of cards with the same paper? 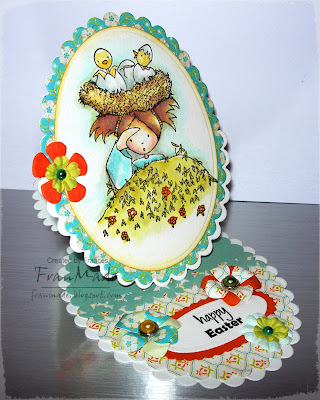 it's the only way I use up big bits of scraps from previous cards - if I don't use them soonish they just pile up in a stack and then gets so out of hand I just need to chuck it out .. I have a pile nearing that stage, just staring at me now :o) Everything else my normal M.O - Copics, lots of MS punches, star nesties, flowers & stickles. 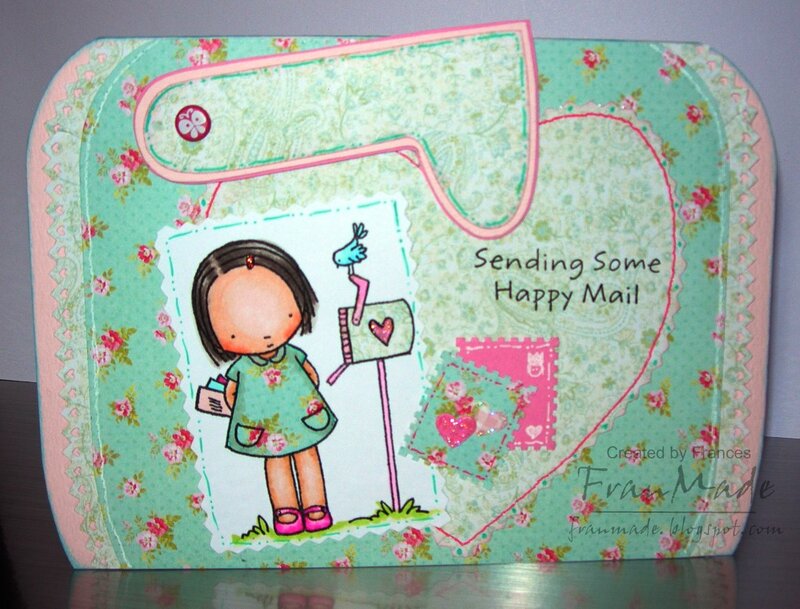 and I've used this cute circular stamp on the inside . .
Well, that's all from me this week I think, so have a lovely weekend and a lovely mothers day for all you mums out there ... as L'oreal says .. 'cos you're worth it' ;). It's CCT time again and I can't quite believe that I've been saying that for 2 years now! Yup, CCT is 2 years old today - how time flies! I've been part of this lovely group of crafty ladies since the start of it and it's been an honour and a pleasure - thank you ladies, it's been a blast - long may it continue :). Isn't she adorable? 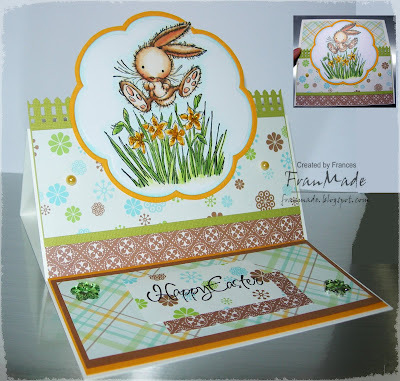 She's a sneek peek of the new spring/Easter collection by Norma Fickel from WoJ, which will be released this Sat (13th March). Well I hope that's made you feel all springy now :) I'm off to go colour in some more of these cuties and maybe fit in a bit of housework too but, I'm not making any promises. . about the housework, anyway! Thanks for dropping by. I made this 3D aperture scene card for the WoJ Inspirations & tutorial blog. Hello & a happy Sunday! It's been a glorious if still a tad chilly, sunny day today and feels like spring might just finally be around the corner. Hope you've all enjoyed the sunshine. 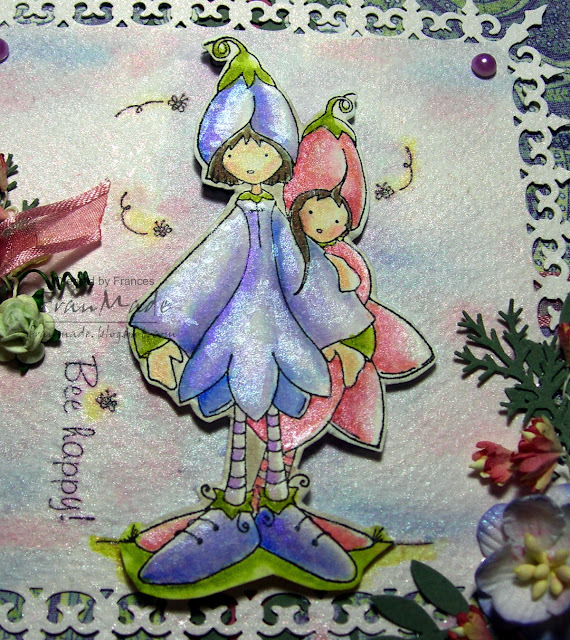 Inked up a couple of cute stamps I got from Silly Monkey's at the weekend and as I still had the scraps from my last card out thought I'd put them to good use and did a spot of paper piercing. 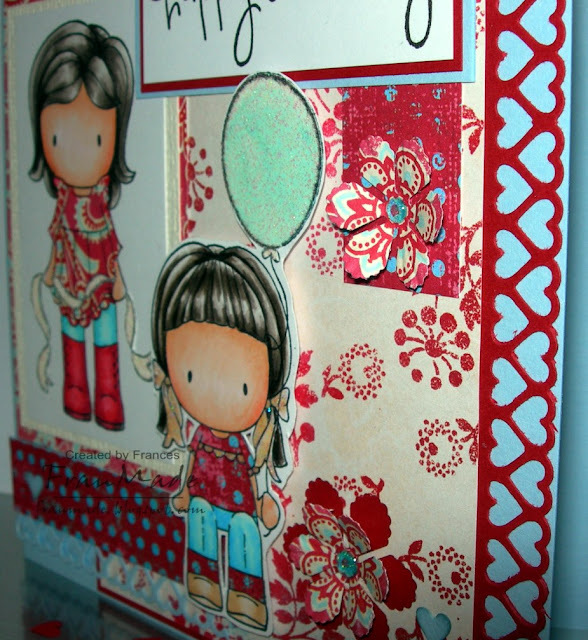 Which just so happens to be the theme over on ABC challenge :) Lots of paper pierced bits on this; the top and ribbon on the girl standing, the t-shirt, trouser cuffs and balloon on the sitting girl.